When I heard Caroline Hirons was coming out with her own cleanser I was jumping up with excitement. Anyone who follows Caroline will know she is very informative and knowledgeable about different skincare products. Everything I know about skincare is because of her. She is really the skincare guru. She always encouraged 'double cleansing', and I only got to know about the benefits of double cleansing after reading her articles. So when this product was launched on Caroline Hirons website, I didn't just grab one, I ordered two - I must say the shipping was pretty expensive! I had a feeling it was all going to be sold out before I knew it, or it would be a limited edition product. First, let me introduce 'Double cleanse' to you if you have not heard of it. Double cleanse is when you simply cleanse twice. The first cleanse removes dirt, makeup, and just breaks down the products which are on your face. This is then removed with a flannel. Then you cleanse again to remove those last bits of leftover products. 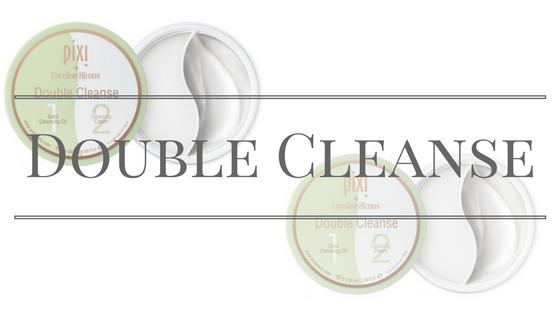 Double cleanse ensures that everything is removed and you are left with a clean face. I never used to do this and would always end up with these little bumps under the skin, however since I started to double cleanse not only does my skin look a lot healthier, glowy, and the bumps have disappeared, therefore the application of my makeup is a lot smoother. I mean if you guys haven't tried it give it a try with whatever cleanser you have at home and let me know how your skin feels? The product itself has two parts, one section is the solid cleansing oil, and the other is the cleansing cream. The product comes in a jar, therefore is travel-friendly. I actually took this with me to Barcelona just because it is so convenient and also meets the travel regulations. The first part of the cleansing is to use the solid oil cleanser. The oil melts when in comes in contact with your face and skin. The oil has ingredients such as avocado oil, Olea fruit oil, vitamin e oil and safflower seed oil. The properties of these oils are really beneficial for the skin. The oil dissolves excess oil from the skin and gently removes makeup and dirt without drying out the skin. I did not suffer any dryness and I normally have dry skin. You know that feeling you get sometimes after you have cleansed your face? that tight dry skin? yeah..you don't get that with this cleanser. The cleansing cream has vitamin c added to it, this helps to restore skin and give it that healthy glow. Vitamin C helps to brighten and even out skin tone. There is aloe vera in this cleanser which is good for soothing the skin. This cleanser is gentle on the skin and contains many nourishing ingredients that will help the skin in the long run. My skin feels hydrated after using this cleanser and there is nothing that gives it that tugging feeling. I normally double cleanse in the evening even if I wear makeup or not. Double cleanse always helps to remove any excess dirt or oil from the skin and it is important to make sure you cleanse even if you don't wear makeup, as our skin collects dirt throughout the day and that can block pores and open up room for spots. Would I recommend this cleanser? Yes! I really do recommend this cleanser as it packs two goodies into one and it is really convenient to have two products in one jar. Would I purchase again? Yes, I would. This retails for £24.00 and it is stocked at M&S and Cult Beauty. £24.00 is expensive but if you think about it, you are getting two products so it's basically £12.00 each. I have already stocked up and I am hoping it is not a limited edition as then I will need to bulk purchase! I have really seen a difference in my skin texture while using this along side Alpha H (review coming soon). I now have the confidence to go outside without any makeup - except moisturiser and lipstick! I don't wear foundation or concealer to work or university. I guess wearing no makeup has also helped to improve my skin in the long term. The only negative I can say about this product is the price however, it is more luxury and high end. There really isn't a smell to this product so it is good for the people who may be sensitive to perfumes. If you guys are looking for a cleanser and do try this out let me know how it goes for you! A quick reminder - what works for me may not work for you, we all have different skin. It may be worth to see if M&S do a sample before you go out to purchase the full 100ml jar. Oh my god you make this sound so good! I've got this sitting on my cabinet right now but I haven't actually tried it yet..no idea why! You should defo try it! I had it sitting around for a while and then once I tried it I got addicted! I hope it suits your skin as it does with mine!